On Thursday, the St Johns boys played in their last football league match against St Peter's. A fantastic final score of 4-1 to St John's means they top the group with a 100% record. Well done to all the boys. We now await our opposition for the semi-finals. 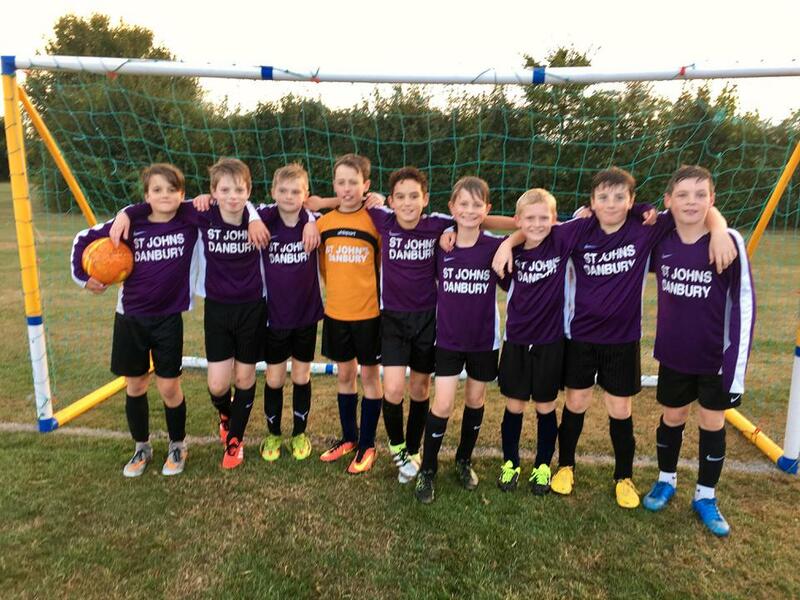 St John’s football team played their third match of the season against Purleigh. It was a tight game but St John’s came out on top, winning the match 2-0. Scorers were Stan H and Tyler W. Well done to all the team. Our last group match will be played at home on Thursday 7th March against St Peters - please come along to support the boys. On Thursday 17th January St John’s play their second football league match against Priory. The boys were outstanding and worked as a team with confidence and skill. A super final score: St John’s 6, Priory 1. Well done to Stan H who scored 4 goals and Tyler W and Oli S who both scored a goal each. Well done to the rest of the team for a tremendous performance: Oliver E, Tom B, Ryan M, Will D, Clark V, Sam H, Finlay C and Harry W. Our next match is on Wednesday against St Peters, kick off 3pm. On Monday 3rd December, St John’s played their first football league match of the season against Danbury Park. It was a great match. St John's showed excellent team work and passed the ball around well together. Final score St John’s 4, Danbury Park 2. Goals from Stan H (2), Finlay C and Clark V. Well done to all the boys who played: Stan H, Tom B, Tyler W, Oliver E, William D, Ryan M, Clark V, Sam H, Oliver S, Finlay C and Harry W. Thank you to everyone who came out in the rain and supported the boys. On Wednesday 14th November, St John’s football team played in their first competitive match of the academic year against Great Waltham Primary. 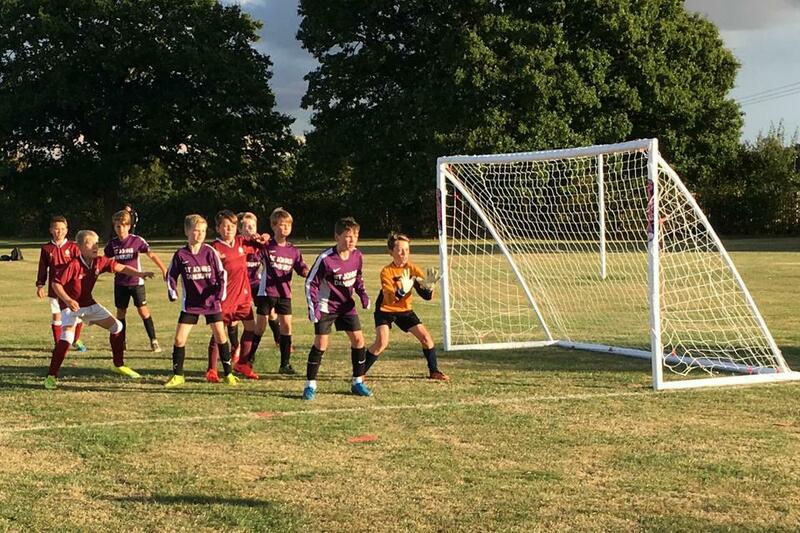 The boys have only been training together for 6 weeks and played some excellent football. They passed the ball well, had confidence in defending and tackling and had much possession in the game. Despite their fantastic effort and play, they were beaten 2-1. It was a terrific friendly to get them ready for their league matches. Well done to: Stan H, Oliver S, Oliver E, Tyler W, Ryan M, Clark v, Sam H, Tom B, Harry W and Finlay C. A big thank you to Joe who has been working hard with the boys in training and for coaching them. Thank you also to all the parents for their support at the game. This year has been fantastic for the St John’s Football Team. They won all their league matches and finished as group winners beating strong teams from Danbury Park, St Anne's and St Peter’s. The boys then progressed into the cup semi-finals where they beat St Anne's 1-0 with a super goal from Jordan F. It was then onto the finals, which was a first for St John's, where they played Great Waltham. 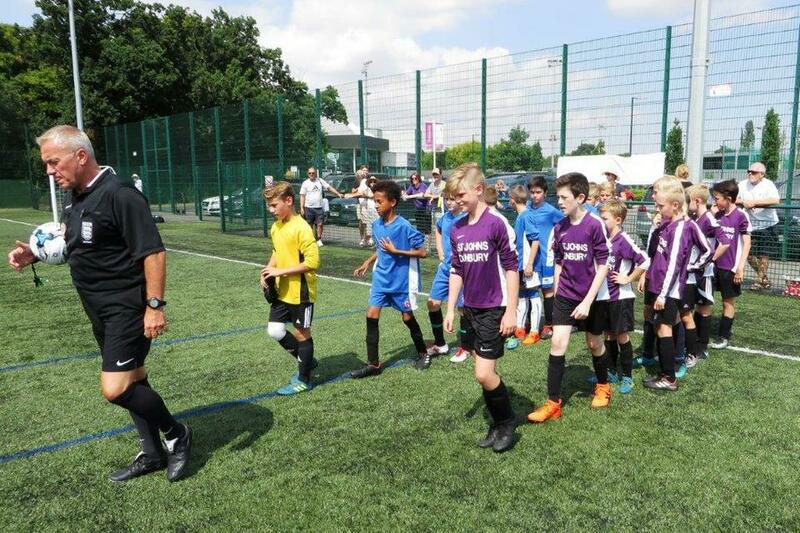 The boys were lucky enough to play on the 3G pitch at Melbourne with an official referee to mark the occasion. Although St John's played with great defensive skills and teamwork, they were unable to beat a strong Great Waltham side. A huge well done to all the boys for a well matched performance: William S, John R, Jasper C-S, Robert B, Max H, Jordan F, Stan H, William D and Tom B. Thank you to all the parents for their support over the year and to Mr Hall for giving up all his time to train the boys, coach their matches and referee games. It has been an extremely successful year boys! 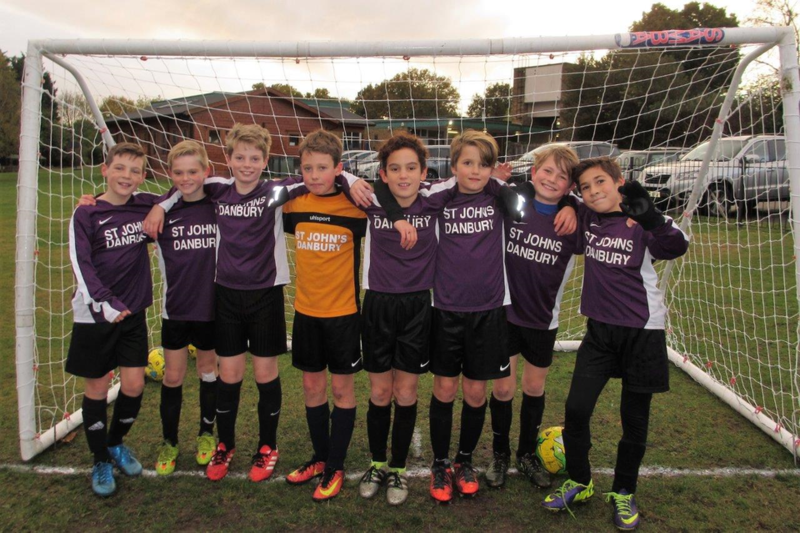 Last Thursday, 30th November, St John’s football team played their second league game against Danbury Park. 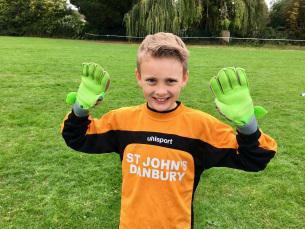 Unfortunately due to illness, our goalkeeper William D was unable to play so Max H stepped in and he certainly showed off his skills. After going 1 - 0 down, the boys showed superb perseverance and team work and it wasn’t long before Jordan F scored 2 quick goals to take the lead. Danbury Park got 1 back and the boys went off at half time 2-2. The boys showed terrific defensive and attacking skills and it wasn’t long before Jordan F had his hat trick. To finish a great match off, Stan H scored a wonderful goal from a corner kick, making the final score 4-2 to St John’s. Well done to: max H, John R, William S, Jasper C-S, Robert B, Tom B, Stan H and Jordan F. Thank you to all the parents who braved the freezing temperatures for all their support and thanks to Mr Hall for coaching and refereeing the game. On Thursday 23rd November St John’s played their first league match of the year against Priory school. The boys played superbly well both in defence and attack. They played well as a team, with great passing and a lot of determination. Well done to Jordan F, Jasper C-S, Max H, Robert B, John R, Tom B, Stan H and William D. The final score was 0-0 and although there were no goals, it was an exciting and thoroughly enjoyable match to watch. Thanks to parents and pupils for their support and Mr Hall for coaching and refereeing the match. Our next game is against Danbury Park on Thursday 30th November - please come along to support us. St John’s football team played against St Anne's in their first match of the season. The boys played superbly well as a team, showed lots of terrific passing as well as solid defence and speed in attack. A huge well done to all the boys who played: Jordan F, John R, Jasper C-S, Max H, Robert B, William S, Stan H, William D and Tom B. The final score was 6-3 to St Johns. Goals from Stan H (1) Robert B (1) an OG and a fantastic hat-trick from the man of the match Jordan F. Thank you to all the parents and pupils for coming to support the boys and to Mr Hall for coaching and refereeing the team. 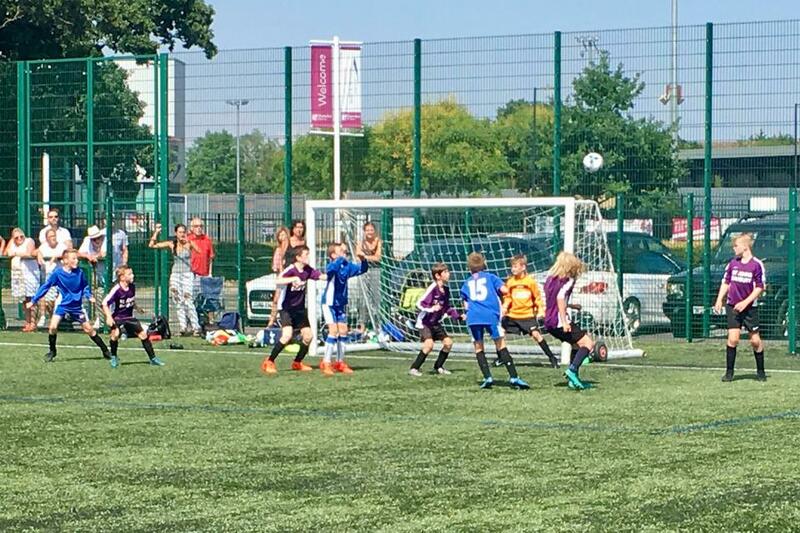 On Wednesday 4th October St John's played in the Chelmsford partnership football tournament. It was the first time the boys had played together and they were full of excitement and nerves! The group stage saw the boys play 4 games - they won 3 and drew 1, with no goals conceded! 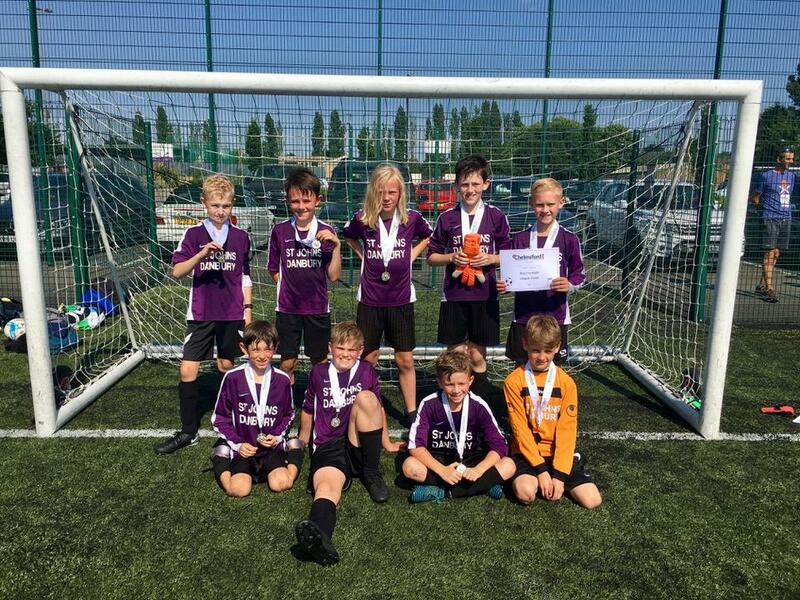 They went onto the semi-finals where they narrowly lost 2-1 to Cathedral school and were extremely unlucky to have lost in their play-off match 1-0 to Tyrells. The boys finished in a fantastic 4th place out of 20 teams and should be really proud of themselves. A special mention goes to man of the tournament - William D in year 5 who played in goal and made some outstanding saves throughout. Well done to William D, Stan H, Archie L, Tom B, Robert B, William S, Max H, John R and Jasper C-S. Thank you to parents who transported the boys and to Mr Hall for coaching the team. 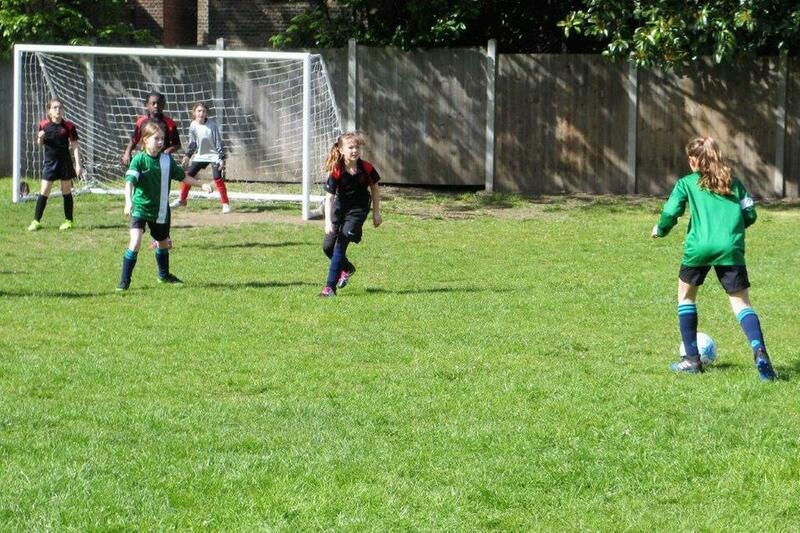 On Wednesday 26th April the girls’ football team played in their final league match of the season. The girls showed terrific team and enjoyment throughout also demonstrating wonderful attacking and defending skills across the pitch. A hat trick by Hermione W and a clean sheet by Laila D helped gain a fantastic 7-0 win. Goals scored by Hermione (3) Jess (2) Chloe and Melissa. A huge well done to the all the girls and a terrific way to end the season. Well done to Chloe B (captain) Hermione W, Jess K, Melissa A, Klara G, Maddie W, Anna J and Laila D. A big thank you to Mr Hall for all his hard work this year with training the girls, taking them to matches and refereeing. Plus a thank you to all the parents who have supported the girls and transported to matches. On Thursday 20th April, the St John's football team played their final league match against St Peters. The boys produced their best skills throughout the match and certainly put in their best performance of the season. A great win which finished 6 - 1 to St John’s. Goals from Ben H x3, Lucas A, Amin R and William S. Well done to all the boys that played: Ben H, Ben P, Lucas A, Maurice L, Amin R, Harry S, Samuel S, John R and William S. Thank you to Mr Hall for training the boys all season and for all the time he has given up to coach and take them to games. Thank you also to all the parents that have transported and supported the boys this year. 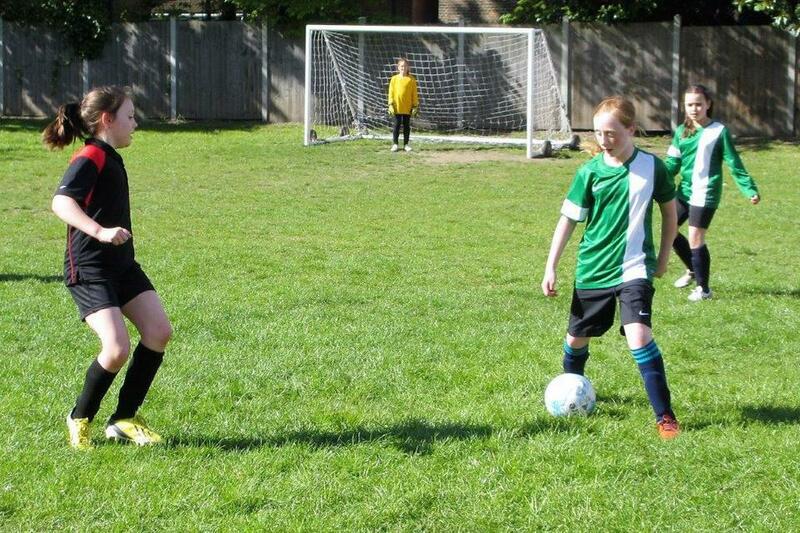 The St John’s football team played a home match against East Hanningfield Primary School on Thursday 23rd March. Despite the result of 2-4 to East Hanningfield the boys played extremely well. Well done to Lucas A, Jordan F, John R, William S, Amin R, Ben P, Zach A, Maurice L and Ben H.
A big well done to the girls who played in the football league match on Monday 16th January against Boreham Primary School. 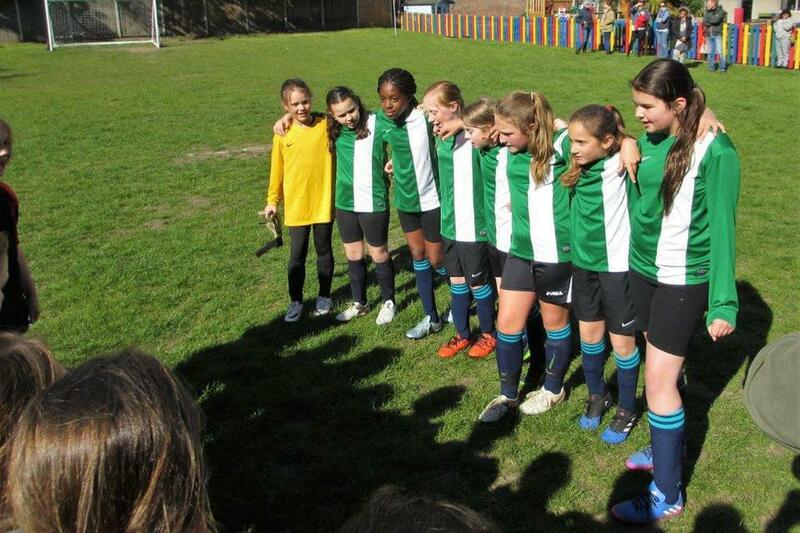 The girls played well and as the match progressed; their confidence grew against a strong and organised Boreham team. Unfortunately we were unable to stop 2 of their talented girls and the match finished 11-0 to Boreham. Well done to Hermione W, Klara G, Mia F, Maddie W, Melissa A, Annabel N, Anna J and Laila D. thank you to Mr Hall and all the parents for their support. 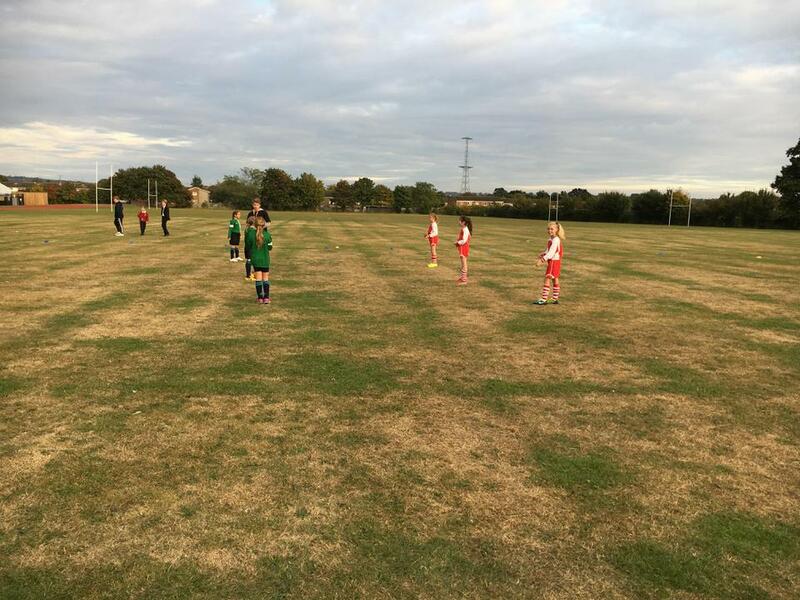 On Thursday the St John’s football team played their first league match against Danbury Park. It was a competitive and evenly played match with plenty of great attacking and defending. 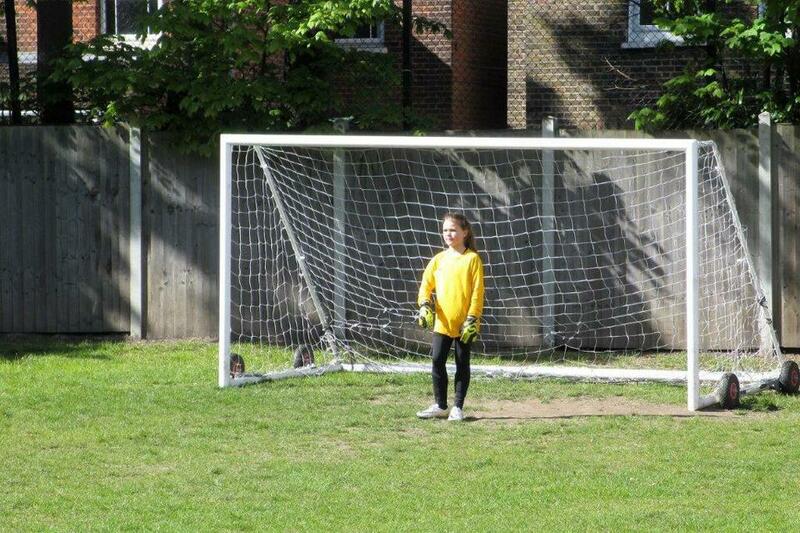 A fantastic 'man of the match' performance by Harry S in goal who made many terrific saves. Well done Harry. The boys showed great spirit, they worked hard as a team and treated us to a wonderful game of football. Final score 4-2 to Danbury Park. A huge well done to: Harry S, Ben P, Ben H, Maurice L, Samuel S, Amin R, Lucas A and John R. Thank you to Mr Hall for refereeing and to all the supporters for coming along to cheer on the boys. 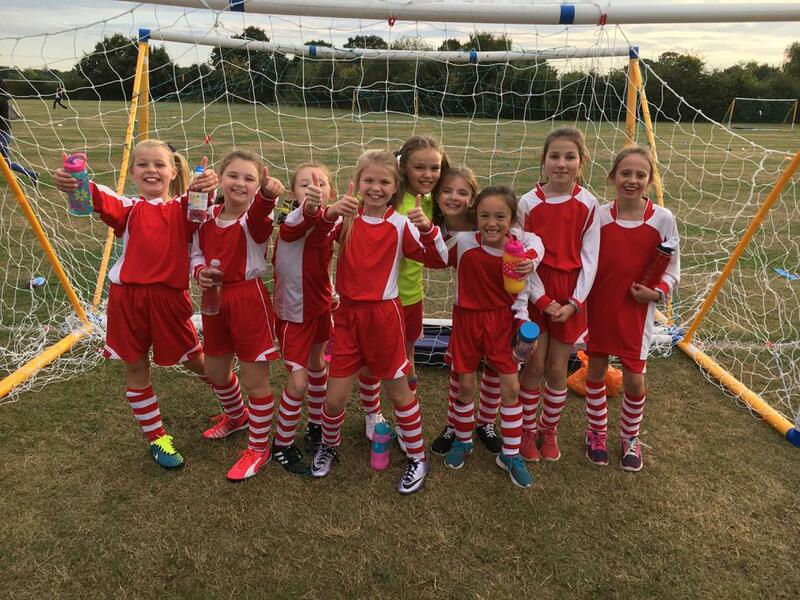 On Tuesday 11th October, the girls played in the Chelmsford partnership football competition. It was a lovely event, full of excitement and nerves as for many of the girls it was their first competitive event. All the girls did superb. They played fairly, with enjoyment and got better as the games went on. After 4 games each in their pool, both teams met in the play- off final which led to much excitement and lots of cheering from the spectators. Well done to: Jessica K, Hermione W, Klara G, Fuschia P, Melissa A, Maddie W, Gabby S, Mia F, Laila D, Evie W, Evie M, Kimberlee H, Iori P, Sydnie J, Grace W, Annabel N, Ana s, Katie W.
A special mention to Laila D and Jessica K, who were selected for an award for their team, showing great sportsmanship and skills throughout the tournament. Thank you to all the parents who came to the event. St John's KS2 football team took part in the partnership boys football competition. It was the first time the boys had played together and they did extremely well. They won 3 out of their 4 pool games, won their knock out match and went on to finish in 6th place. Well done to Ben H, Ben P, Lucas A, Maurice L, Samuel S, Harry S, Jordan F, John R, Matthew G. A great achievement boys! Year 5 boys entered a school team into the London 5 a side cup and got a fantastic 3rd place overall. They played 6 games in the initial league system winning three games, drawing two and losing just once. All St Johns goals came from the boot of Ben H. That placed them into the semi-final which saw them lose narrowly and achieve joint 3rd in the competition. The team was Lucas A, Ben P, Ben H, Callum C, Harry S, Samuel S and Maurice L who all played brilliantly! 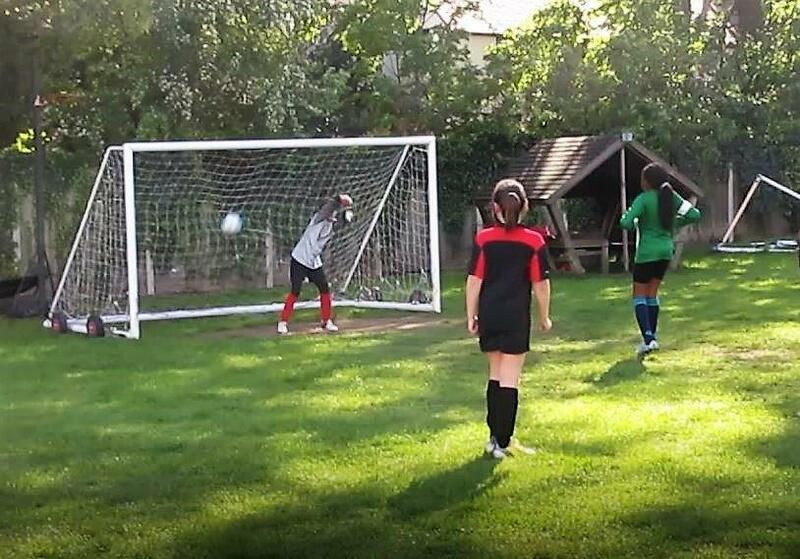 St John's Girls Football team played a match against Priory. Despite the heavy rain, the girls played really well and as the game went on their confidence and skills developed. Well done to: Hermione W, Klara G, Fuschia P, Maddie W, Mia F, Chantel H, Esme J, Kerry S and Lily M. Final score - St John's 1 Priory 1. A terrific goal for us by Hermione. Thank you to all the supporters for their encouragement and support and to Mr Hall for coaching and refereeing the game. St Johns played their final league match of the season on Thursday 3rd March against St Peters School. It was an extremely enjoyable match to watch with plenty of fine skills from both teams. Final score 5-3 to St Peters, goals for us scored by Cayden G and Ben H x2. Well done to Cayden G, William B, James W, Finley W, Charlie W, Josh D, Maurice L, Ben P, Ben H. A big thank you as always to Mr Hall for refereeing the game and coaching the boys. And also a thank you to parents and pupils for coming to watch and support the team. 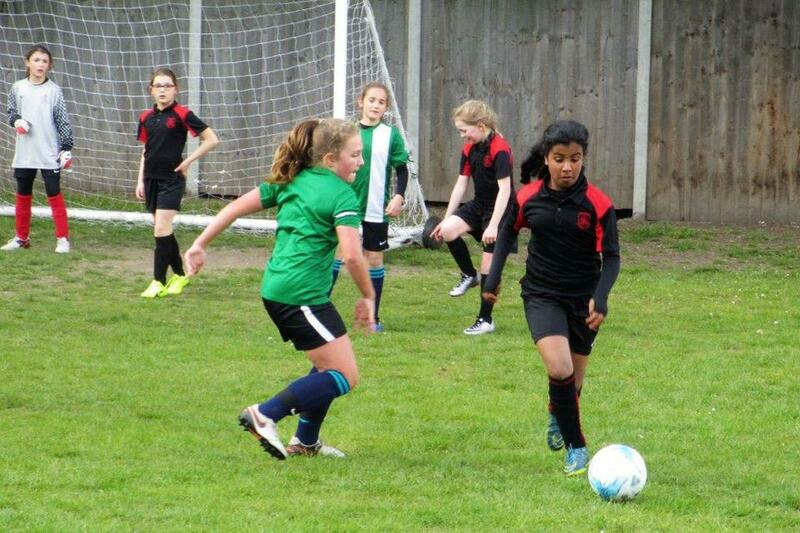 On Friday 27th November the girls’ football team played against St Anne's. The girls were terrific and showed such an improvement since taking part in the competition earlier in the term. The match was full of fantastic passing skills, attacking and defending and played with such a positive spirit. Final score 5-4 to St Anne's - goals by Hermione, Chantel and 2 from Esme. Well done girls: Hermione, Klara, Fuschia, Lucy, Kerry, Chloe, Esme, Chantel, Lily M. Thank you to Mr Hall and all the parents for their encouragement and support. Final score St Johns 6 - St Anne’s 0. It was a terrific match full of great team work, skills and passing. 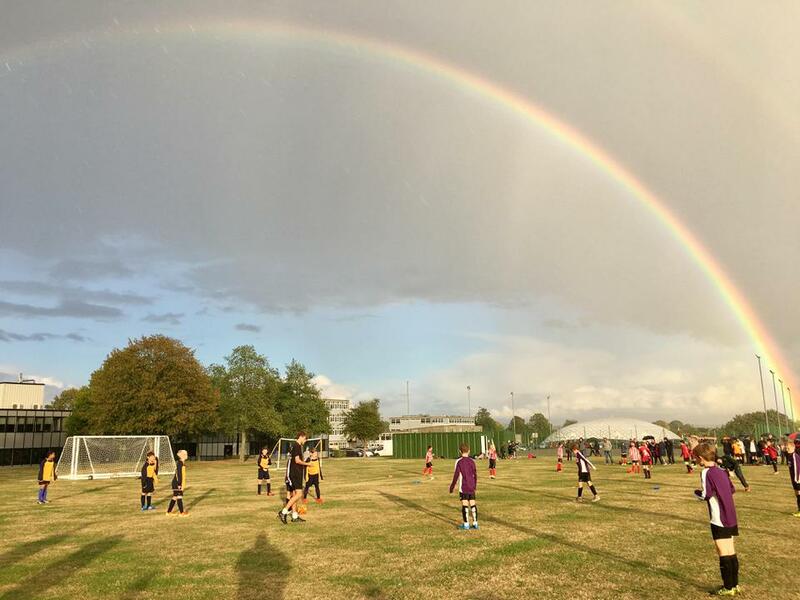 On Wednesday 11th November St John's football team played against East Hanningfield. It was a thoroughly enjoyable match to watch and the boys showed an excellent team spirit and some good skills on the pitch. Final score 2-6 to East Hanningfield. A big well done to Charlie W, Mason B, Josh D, William B, Fredcian R, Finley W, Thomas E, James W, Ben H, Lucas A. Thank you to all the parents for coming along to cheer us on. On Thursday 5th November St Johns played their first league football match against the Priory School. It was an excellent start to the season and the boys played really well as a team. Well done to Charlie W, Finley W, James W, Cayden G, Lloyd B, Fredcian R, Josh D, Ben H and Lucas A. The final score was 3-3 with 2 goals coming from Finley and a penalty scored by James. Man of the match this week goes to Fredcian, a terrific game in defence. Thank you to Mr Hall who coached and refereed the match and all the parents who came to support despite the heavy rain!!! A huge well done to all the boys and girls who took part in the Chelmsford school sport football competitions on Tuesday 6th October. All the children played superbly well and it was lovely to see lots of smiles on faces. For many of the children it was their first time playing in competitive matches. 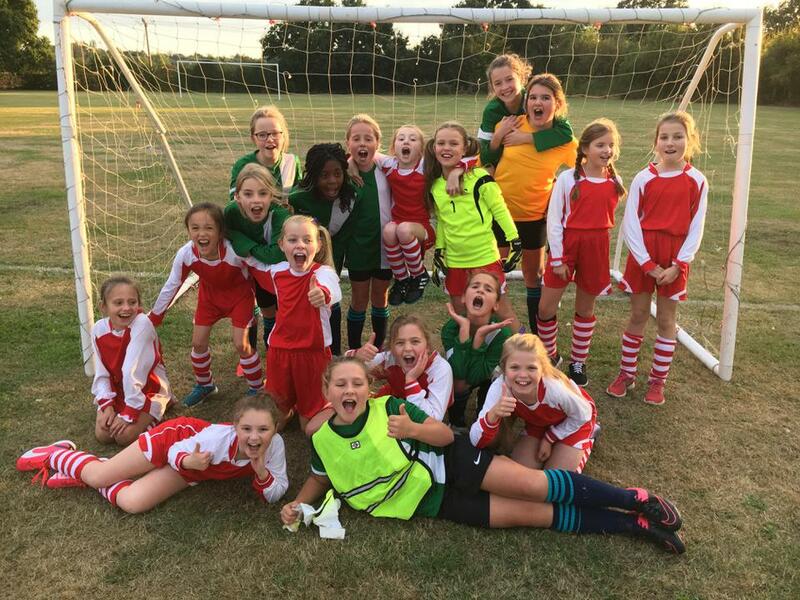 A BIG thank you to Mr Hall who has given up his time to train and manage the children and for his kind donation of a new football kit worn by one of our girls' teams. A special mention to Charlie W for his terrific goal keeping skills during the boys’ competition. Finally thank you to all the parents for their support with transporting the children and showing so much encouragement. Boys - James W, William B, Charlie W, Lloyd B, Cayden G, Finley W, Josh D, Ben H.
Girls - Lucy H, Nicole B, Poppie S, Alice D, Faye B, Esme J, Chloe L, Sophie G, Sarah B, Chantel H, Lily M, Kerry S, Melissa A, Mia F, Fuschia P, Annabel N, Maddie W, Hermione W, Klara G.